Congratulations to Thy & Brian, they were a lot of fun to work with and really enjoyed their celebration. The Japanese Friendship Garden was the perfect reception setting and the Administrative Courtyard is a hidden gem for a ceremony! 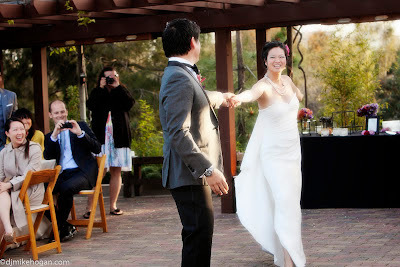 Favorite Moment – For me it was the first dance, they did a 2 minute choreographed dance it was perfect! Favorite Element – Loved the market lighting and the mini donuts! Kudos – Stefanie and the team at Creative Affairs, Rae Florae, Peartrees Catering, Entertainment at Large, Acres of Hope Photography, Ken Day Weddings and A Perfect Wedding. Mike, it was a perfect day! Your DJ service was awesome! You were able to tailor the music to all ages and for months after the wedding we had so many people come up to us and tell us it was the best wedding they have ever been to. I attribute that to you being able to get the olfer folks on their feet. Thank you, Thank you, Thank you!